Donald Trump became America’s President despite long odds. Hillary Clinton was considered to be the President-elect by almost everyone up until we actually voted. So what happened? Many Americans are looking past the news the mainstream media has been feeding them and looking around. They have reached the point where they are choosing to believe what they see rather than what they are being told. As the middle class of America struggled under the Obama administration, those in the bureaucracy increased in number and prospered. The richest counties in America are adjacent to Washington, D.C. That is not a coincidence. The political and media elite are looking out for their own interests while ignoring the well being of their fellow countrymen. Those countrymen elected Donald Trump. Those feelings are not unique to America. They recently erupted in France. The Wall Street Journal posted an article yesterday about the recent riots in France. 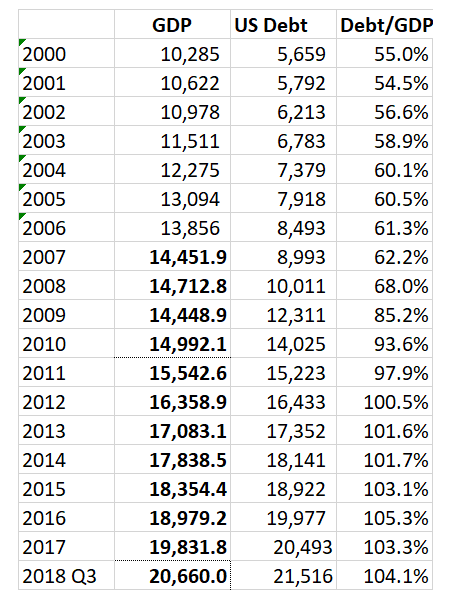 The straw that broke the camel’s back was the drastic increase in the gasoline tax, but that was the straw–the issue is much bigger. In case you were wondering, a deeply justice-based agenda means that the United Nations would be in charge of all political and economic activities of its members. There would be a movement toward socialism and a great loss of the freedoms we enjoy in America and in other western countries. The French were right to revolt. On Friday, Investor’s Business Daily posted an editorial about the Clinton Foundation. The editorial deals with the drop in donations to the Foundation after Hillary Clinton lost her bid for the Presidency. Controversy over the foundation erupted after Peter Schweizer’s 2015 book — “Clinton Cash” — suggested that the foundation served as a way for donors to curry favor with then Secretary of State Hillary Clinton. And, indeed, the multitude of connections that slowly turned out became hard to dismiss as coincidental. There was the fact that 85 of the 154 private interests who’d met with Clinton during her tenure at state were Clinton Foundation donors. Emails turned up showing how the foundation intervened to arrange a meeting between Clinton and the Crown Prince of Bahrain, a country that had been a major foundation donor. A Chicago commodities trader who donated $100,000 to the foundation got a top job on a State Department arms control panel, despite having no experience in the area. On and on it went. But the most glaring indictment of the Clinton Foundation came from what happened last year, after Hillary Clinton lost the election — and effectively ended her political career. First, the Clinton’s almost immediately shuttered the Clinton Global Initiative and laid off 22 employees. If the Clinton Foundation was as good as defenders claimed, why did all its big-time donors suddenly lose interest? The only reasonable explanation is that donors weren’t interested in what the foundation supposedly did for humanity. They were interested in the political favors they knew their money would buy. At one time there was an investigation into the Clinton Foundation. I have no idea whether or not it is ongoing. However, just looking at the amount of money spent on overhead and the rapid drop in donations when Hillary was not elected President, I think there are some obvious conclusions that anyone paying attention can draw about the Foundation. Will We Ever See Justice? U.S. District Court Judge Emmet G. Sullivan ruled on Thursday that former Secretary of State Hillary Clinton has 30 days to answer additional questions about her email scandal. The decision comes after Judicial Watch filed a lawsuit to obtain additional information from Clinton and Director of Information Resource Management of the Executive Secretariat John Bentel. The watchdog group also wanted top Clinton aides and State Department officials, including Huma Abedin and Cheryl Mills’, deposition videos made public. The treatment of Mrs. Clinton flies in the face of equal justice under the law. As anyone who has ever held a security clearance knows, you have to sign a paper saying that you understand the rules for handling classified material and that you will follow them. I don’t know if Mrs. Clinton signed that paper. I do know that she chose not to follow the rules about handling classified material. There should be some penalty for that behavior. The Washington Free Beacon posted an article today about a barrage of outside spending by a 527 group led by billionaire activists George Soros and Tom Steyer which impacted governor and legislative races in several targeted states. The ultimate goal of the targeting was to redistrict specific states in order to make it easier for Democrats to be elected to the House of Representatives. The National Democratic Redistricting Committee (NDRC) believes one of the reasons Republicans have enjoyed a lengthy majority in the House of Representatives is because of gerrymandered house districts. Because state legislative bodies usually draw house districts, the NRDC was trying to elevate some of these elections by putting a national veneer on races that usually come down strictly to local politics. For an example from the list on the NDRC’s site, Democrats (technically members of the Democrat Farmer-Labor Party) won a majority in Minnesota’s state house of representatives. Although I don’t like to see that kind of money from outside a state poured into state races, there is something we all need to remember here–every American is responsible for his own vote. We have the option of doing our own research and not being swayed by an abundance of campaign ads for a particular candidate. Money is important in elections, but as Hillary Clinton and Jeb Bush proved in 2016, all the money in the world will not elect a candidate who is not supported by the electorate. George Soros and Tom Steyer do not represent me, but they do have the right to donate to any candidate they choose, just as I do. 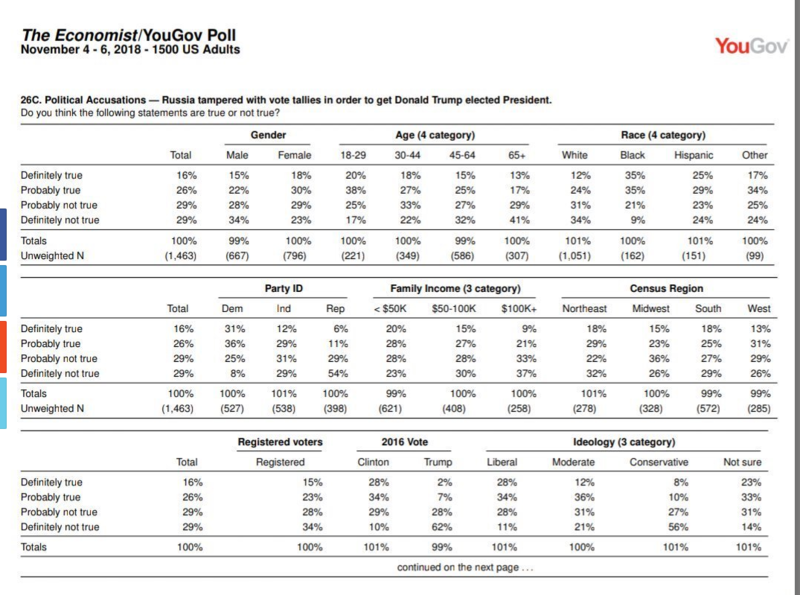 I realize that the print is small, but essentially the chart shows that 42% of all Americans believe that Russia helped defeat Hillary Clinton in 2016. This is true despite the fact that in two years there has been absolutely no evidence to support that claim. This is chilling. It means that through a deceptive media campaign Americans can be convinced that any election the media does not like the outcome of can be labeled fraudulent and that many Americans will believe the label. This sort of disinformation campaign is a threat to our republic, but the even bigger threat is voters who believe everything the mainstream media tells them without doing their own research. The Gateway Pundit is reporting today that the third quarter GDP was 3.5 percent. The US GDP for the third quarter was reported at a whopping 3.5% under the leadership of President Donald Trump. This was another BIG Trump win which doubles the first quarter growth of 2.2%. President Obama never reached an annual GDP Growth rate of more than 3.0%. No President over the past century had not ever been held to GDP growth rates of less than 3.0% until Obama. Note the large increase in GDP ratio to debt between 2007 and 2009. The way to bring that ratio back down is to grow the economy. It will be a slow process, but it can be done. One thing to keep in mind when looking at the above numbers is what would have happened had Hillary Clinton been elected in 2016. The policies of President Obama would have continued–slow economic growth, high unemployment, increased dependency on food stamps, etc. One political theory that is embraced by some in the political left is Cloward Piven. The Cloward-Piven strategy is a political strategy outlined in 1966 by American sociologists and political activists Richard Cloward and Frances Fox Piven that called for overloading the U.S. public welfare system in order to precipitate a crisis that would lead to a replacement of the welfare system with a national system of “a guaranteed annual income and thus an end to poverty”. I believe that the outcome of the Cloward-Piven theory was the goal of the economic policies of President Obama and expected President Hillary Clinton. We have temporarily dodged that bullet, but we need to remember that there are powerful Americans working toward that end. The mainstream media is treating the loss of these clearances as a move by Clinton to avoid a political snub by the Trump administration. The article points out that Hillary Clinton should have lost her clearance when it was discovered that she had classified information on her private servers. Unfortunately, Hillary’s servers were not the only problem. For instance, the group of House IT aides who made up what amounted to a spy ring didn’t even have to undergo background checks to get their insider positions—jobs that allowed them to see and copy all of the emails and more from the members of Congress they worked for. Evidence shows that Imran Awan, the head of the group who was an IT aide working for Rep. Debbie Wasserman Schultz, a Democrat from Florida, was spying on congressmen and even congressional staffers. A current IT aide who wants his name kept out of print told me Awan even used his own email address as the Apple IDs when setting up staffer’s phones. “The only reason I can think of for why Imran would do that is this would have given him the ability to see everything these staffers were doing,” said the House IT aide, a contracted employee who has more than a decade of experience working for congressmen. This IT spying scandal, however, was covered up – as it only had to do with Democrats in Congress, the mainstream media apparently had no interest in pursuing the story. But this lax security is not simply a political story. It puts every one of us in jeopardy. A congressman whose private emails or other data are in the hands of someone who can blackmail or otherwise influence them is a risk. For all of us. And without public pressure, it’s next to impossible to know whether Congress has tightened security to prevent this kind of spying from taking place. Only weeks ago, a volunteer on the staff of a member of the U.S. House of Representatives, Jackson A. Cosko, was arrested after Capitol Police became aware the Wikipedia pages of three U.S. Senators had been edited to include restricted personal information without their knowledge or permission. If Cosko hadn’t posted the information, as he is alleged to have done, for political purposes (called “doxxing”) but had instead used it privately or even gave it or sold it to a news agency or a foreign government, he might never have been arrested. Or he might have gotten off just as Imran Awan and his associates did. What other employer allows former employees to access their networks? Companies commonly terminate employees email accounts and access before they even tell them they’ve been let go. The government needs to learn the lesson that private companies have already learned. The Hillary Clinton private email server scandal is old news. However, there is a new aspect of this story that has just recently come out. Yesterday The Daily Caller posted an article about the Chinese hacking into Hillary Clinton’s email server. Wow. The Chinese had all of our classified correspondence from the State Department in real time. That is scary. For a list of the federal laws that may have been violated in setting up the private server go here. It is difficult to create a totally hack proof server, but had Hillary used her proper email address and government servers, it is much less likely that the Chinese would have been able to obtain the classified information that flowed through the State Department during her tenure. The rules and regulations regarding email by government bureaucrats are there for a reason. Although I have my theories as to why she ignored them, by ignoring them she put national security issues of America at risk. That is not acceptable. On August 22, Real Clear Investigations posted an article about the investigation into material on Anthony Weiner’s laptop. There are some serious questions both about how that investigation was handled and about the current location of the laptop. I strongly suggest that you follow the link to read the entire article, but I will try to point out some of the highlights here. Far from investigating and clearing Abedin and Weiner, the FBI did not interview them, according to other FBI sources who say Comey closed the case prematurely. The article then explains much of the background of the irregularities in the investigation and why the investigators need to be investigated. A final mystery remains: Where is the Weiner laptop today? The whistleblower agent in New York said that he was “instructed” by superiors to delete the image of the laptop hard drive he had copied onto his work station, and to “wipe” all of the Clinton-related emails clean from his computer. But he said he believes the FBI “retained” possession of the actual machine, and that the evidence on the device was preserved. The last reported whereabouts of the laptop was the Quantico lab. However, the unusually restrictive search warrant Strzok and his team drafted appeared to remand the laptop back into the custody of Abedin and Weiner upon the closing of the case. 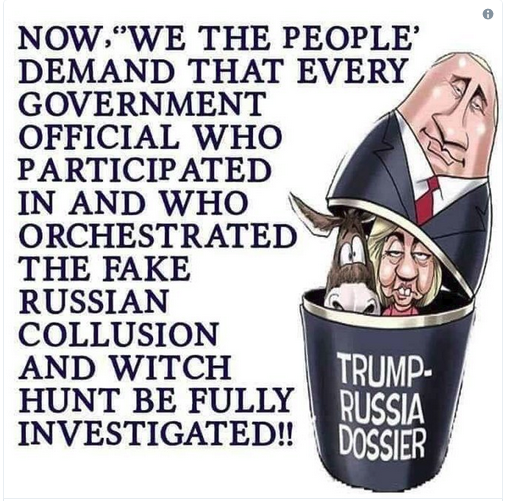 Wherever its location, somewhere out there is a treasure trove of evidence involving potentially serious federal crimes — including espionage, foreign influence-peddling and obstruction of justice — that has never been properly or fully examined by law enforcement authorities. When will we have an honest enough Justice Department to investigate the mishandling of classified information and other crimes that are involved in this case?